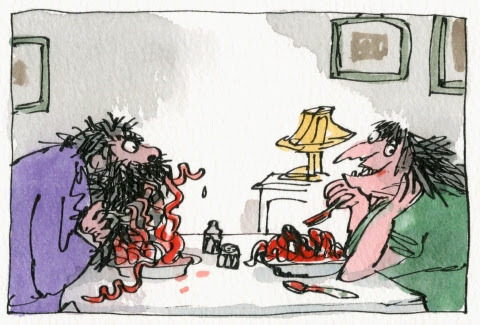 Quentin Blake: Inside Stories celebrates the work of one of the world’s most important and best-loved illustrators. Best known for his illustrations in the books of Roald Dahl, Quentin Blake’s work is recognised worldwide. The kids and I are huge fans so just had to visit this special exhibition at the National Museum Cardiff. There is parking situated behind the museum, off Museum Avenue (CF10 3NP). It costs £6.50 and you can purchase an exit token from the Museum Shop. As we were also visiting other places in Cardiff I parked in the on street parking in St Andrew’s Crescent (CF10 3DD). During the short walk to the museum, we looked for Pokemon and also ladybirds and caterpillars (yes, kids really can be into both the natural and the digital World). I find Pokemon Go useful for the the kids learning names of important landmarks in the new places we visit. Entry into the National Museum is free. The museum is open Tuesday–Sunday, 10am–5pm (Galleries close at 4.45pm). We made our way straight to the Inside Stories exhibition. Four year old Isabelle asked if this was a statue of Quentin Blake. (sorry Mr Blake). It is actually a bust of William Adams, a mining engineer and one of the first members of Cardiff’s Naturalist’s Society by Edward Onslow Ford (1852 – 1901). I also had to take a photo of the girls by this vase just to show the sheer size of it. those exhibitions that is best seen in person anyway. As we walked into the gallery it felt like stepping into a book illustrated by Quentin Blake. There are huge illustrations and quotes painted directly onto the walls as well as the original first roughs, storyboards and finished artwork framed around the room. As we walked around, Izzy took in the art work while I read her the blurbs about each piece. This exhibition gives a unique insight into the origins of some of Blake’s most iconic and popular creations, ranging from his illustrations in Roald Dahl’s The Twits and Danny the Champion of the World, to his own Clown, The Boy in The Dress by David Walliams and illustrations in books by John Yeoman, Russell Hoban and Michael Rosen. My favourite parts were seeing the illustrations from my most read books, such as Matilda, but it was interesting to be introduced to new (to me) work too. Despite being a fan of Michael Rosen’s writing I have somehow missed reading Sad Book. I was in tears reading this text which chronicles Rosen’s grief at the death of his son Eddie. A moving combination of sincerity and simplicity, it acknowledges that sadness is not always avoidable or reasonable and perfects the art of making complicated feelings plain. It wasn’t made like any other book either; Michael Rosen said of the text, ” I wrote it at a moment of extreme feeling and it went straight down onto the page … Quentin didn’t illustrate it, he ‘realised’ it. He turned the text into a book and as a result showed me back to myself. No writer could ask and get more than that.” And Quentin Blake says that the picture of Michael “being sad but trying to look happy” is the most difficult drawing he’s ever done… “a moving experience.” I have since ordered a copy of this book. There is also a video installation that the girls enjoyed watching while sitting opposite each other wearing headphones (I really wanted to take a photo of them but didn’t want to get in trouble!). It was great seeing Quentin Blake at work drawing these iconic illustrations. As well as being a nostalgic exhibition seeing these illustrations from our favourite childhood books it was also educational and inspirational for any aspiring story writers and illustrators. My kids couldn’t wait for their turn on the drawing table to create their own piece of art to take pride of place in the exhibition. I double checked and I was allowed to take photos of my kids and their own illustrations (I would have felt sad leaving their pictures there otherwise). Rebecca drew Matilda, here it is hung up by Blake’s birds. Isabelle drew some flowers. I admired their work before it was possibly covered with someone else’s new artwork. We had a great time at this free exhibition and I would highly recommend it for children and adults alike. 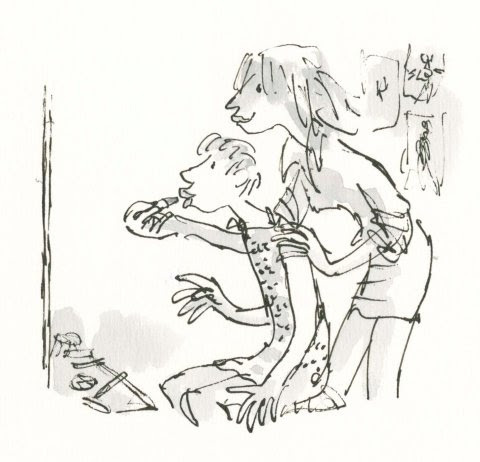 Quentin Blake: Inside Stories is a touring exhibition, which was co-curated by Quentin Blake and Claudia Zeff for the opening of House of Illustration, the UK’s centre for the art of illustration. The exhibition at National Museum Cardiff is supported by the Welsh Government and forms part the Roald Dahl 100 Wales celebrations taking place throughout 2016. In addition to this exhibition, there are Family Workshops taking place between 2-4 August and an Art Lunchtime Talk taking place on 9 September. 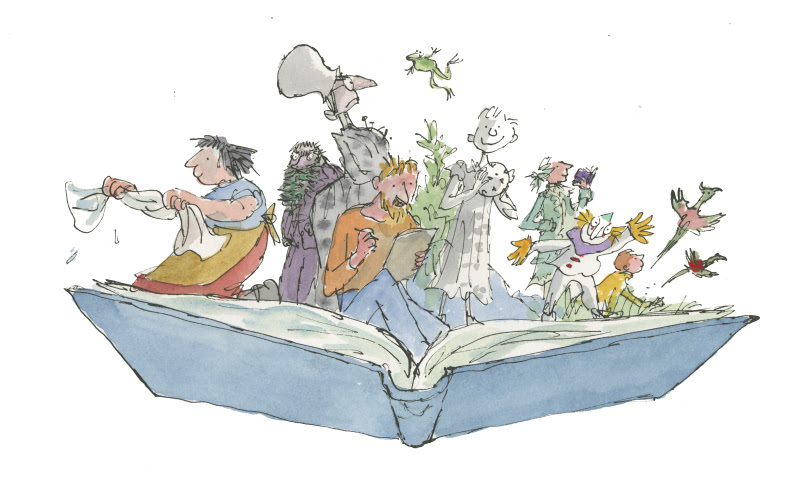 Quentin Blake: Inside Stories is at National Museum Cardiff until Sunday 9th November. Find more special events in honour of Roald Dahl’s birthday on the RoaldDahl100 site- we’re looking forward to The Wondercrump World of Roald Dahl tour at Wales Millennium Centre which opens this August. We combined our visit to the National Museum Cardiff with a show at the nearby Sherman Theatre. Quentin Blake “Inside Stories” will be at Laing Art Gallery from 11th March to 8th July 2017.